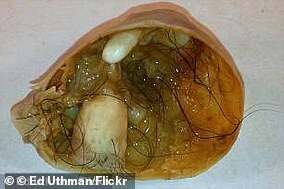 Doctors described the growth as ‘very foul-smelling’ and said it also had hair inside it. The unnamed 32-year-old went to a hospital in Rochester, Michigan, because she’d had pain in the torso for about a week, with it getting worse in the past few days. 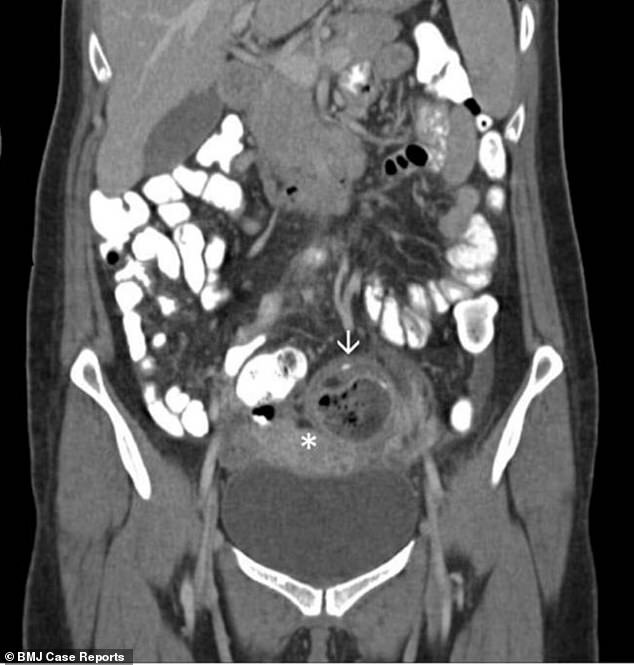 CT scans showed the woman’s left ovary was attached to the wall of her pelvis and to part of her bowel. An explanation of her case, published in the journal BMJ Case Reports, said doctors suspected a ‘superinfection’. And beside the ovary, there was a 4.7cm by 4cm mass containing vegetable fibre, human hair, gas, fat, and calcium build-up. They said: ‘Content of the left ovary was consistent with dermoid, very foul-smelling, suspected of superinfection. The doctors suggested the reason the cyst contained vegetable fibre was because the woman’s bowel had perforated and the matter leaked out. But they couldn’t find any proof of this happening and left the mystery unsolved. Her medical history revealed she had given birth twice by caesarean section but did not link this to her condition. Surgeons cut out her cyst and treated her with antibiotics in hospital for nine days afterwards, and she was then discharged with no further issues. Dermoid cysts are growths which can occur on women’s ovaries, and are also known as teratomas, which comes from the Greek word for ‘monster’. The cysts tend to be benign, meaning they aren’t cancerous, and stem from embryo cells which have the potential to develop into various types of human tissue. For this reason, the cysts can contain hair, teeth and skin tissue, which the cells have developed into outside of their normal locations. They often develop from cells which were left in limbo and never fully grew after the patient was born. For this reason, the cells possess everything they need to morph into any of several types of tissue, but it remains unclear why the strange and usually harmless phenomenon occurs to some women and not others. Teratomas that contain cells that have not yet become distinguished are dangerous because they can become cancer cells. Most cysts, although they can grow to be large and press on other organs and tissues, can be safely removed with surgery.